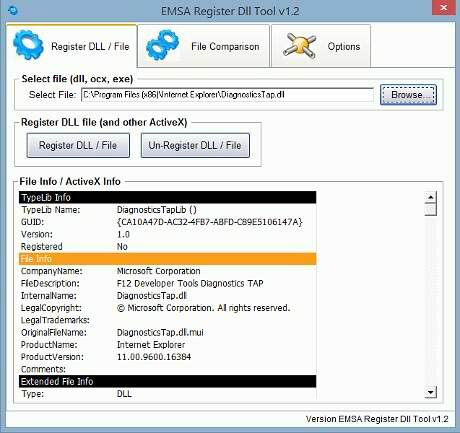 Emsa Register DLL Tool is a multipurpose DLL information & registration tool for Windows. We made this program because we could not find other good tools of this type. Also, our program has far better results at registering dll files regardless of their location. Consequently, it is an invaluable tool that even us, as developers, also use on a daily basis. In many cases, registering dll files can be a problem, especially on newer Windows systems like Win7, Win8.1 and Win10. Various errors might occur when attempting to register dll's. This is a problem we encounter daily. However, our tool is able to register the dll in most cases. For example, we recently used it to register the dll file VB6IDEMouseWheelAddin which is an addin for Microsoft VB6, and registration went flawless while other attempts did not work. Note: There are two types of DLL's, some that require registration (ActiveX dlls) and others that don't (standard dlls). If you don't know which type of dll you are dealing with, it's quite simple. Just download our program and browse to the dll file to see the dll information. If there a "Typelib" section with information, then this is an ActiveX dll which needs registering. This program provides extensive information about system files and other binary files, like exe, dll, and ocx files. It also provides ActiveX information for ActiveX components like .ocx files and ActiveX exe or ActiveX dll files. Using this tool, you may register/unregister ActiveX dll/ocx/exe files, and you may also compare two ActiveX files having identical filenames. This program also provides a very handy function, which can be used to easily register and unregister ActiveX files - Shell extensions. If shell extensions are enabled (look for it in the Options and Help tab), user may right click on any dll or ocx file and select an option from the context menu (register/unregister) to perform the corresponding action. Another neat feature of the same Shell extensions capability, is the ability to generate an ActiveX report on a folder. To do this, first of all make sure that Shell extensions are enabled within the program, then close it (Shell extensions do work even if the program is closed). Then, you may select a folder at any time, right click on it and from the drop down menu select ActiveX Report. This will scan the folder for ActiveX files, and a text file (output.txt) containing the report will be generated in the same folder, and it will also be opened automatically for viewing. We believe this tool can be useful for anyone looking to get extended file informations and dll/ocx registration capabilities. If the program does not work (e.g. does not register dlls), please make the compatibility settings in the "Windows 10 setting" above. This should normally fix any issues.